A poignant look at loss, love, and taking things one moment at a time. One sleepless night when illustrator Hallie Bateman was in her early twenties, she realized with dread that someday her mother would die. The prospect was devastating, and also scary—how would she navigate the world without the person who gave her life? The next day, Hallie asked her mother, writer Suzy Hopkins, to record step- by-step instructions to follow in the event of her death. The list began, “Pour yourself a stiff glass of whiskey and make some fajitas,” and continued from there, walking Hallie through the days, months, and years of the rest of her life with all the motherly advice, along with recipes and checklists, a daughter might need to help her through the challenges to come, including the ordeal of losing a parent. The project became a way for mother and daughter to connect with humor, honesty, and gratitude. Here is a heartfelt excerpt for getting through life without one’s mom. 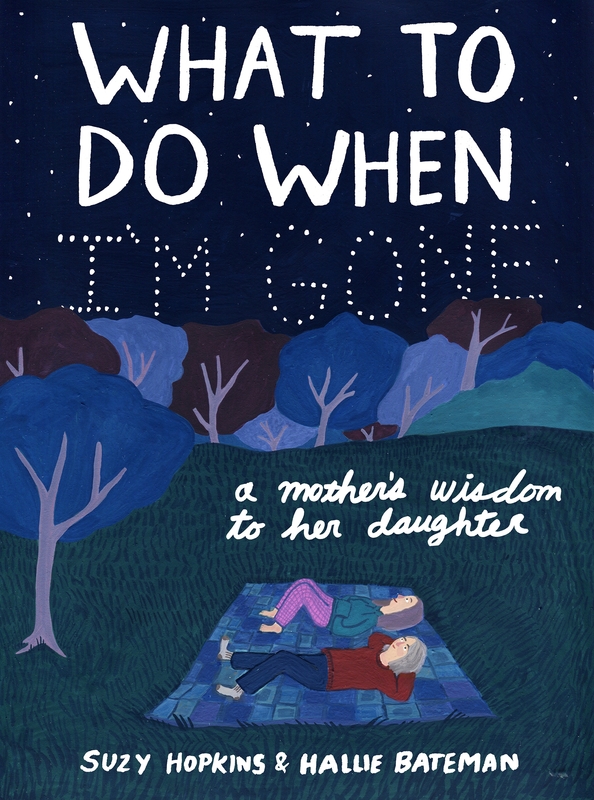 Combining Suzy’s wit and heartfelt advice with Hallie’s quirky and colorful style, What to Do When I’m Gone (Bloomsbury) is the illustrated instruction manual for getting through life without one’s mom. It’s also a poignant look at loss, love, and taking things one moment at a time. A whimsical, funny, touching, and above all pragmatic guide, it will spur conversations that enrich family members’ understanding of one another. Hallie Bateman is an illustrator and writer whose work has appeared in the New Yorker, the New York Times Magazine, Lenny, BuzzFeed, the Awl, and elsewhere. Her creative journal, Brave New Work, was published by MOMA in 2017. She lives in Los Angeles. Suzy Hopkins is a former newspaper reporter who since 2008 has published a quarterly magazine (Friends and Neighbors, www.seniorfan.com) for boomers and seniors in California’s Central Sierra. She is also Hallie’s mom. She lives in Columbia, California.